Just when you thought bicycle designs couldn't get any simpler, along comes Scalyfish Designs to, well, simplify it. The Bellingham, WA-based design studio, which is led by Josh Bechtel, recently unveiled the Bicymple, a super-compact, chainless bike that takes everything you thought you knew about bicycles and turns it on its ear. With the Bicymple, the design is streamlined but the functionality remains intact, as it can do just about everything you'd expect from a typical bike—and more. As the designers point out, moving the wheels closer together would make the Bicymple for city dwellers to store. And as anyone with a fixed-gear or single-speed bike will attest, the fewer components a bike has the easier it is to maintain; removing the chain takes away yet another thing that can break. The Bicymple is still in development, and Scalyfish working on production and distribution models. And so far a price for the bike hasn’t been released. Bikes like this have been around for a while. They are called circus bikes (http://www.unicycle.com/unicycles/ultimate-wheel/hoppley-circus-bike.html) and are nothing new. If you really want ultimate maneuverability and a compact design learn how to ride a unicycle. IT looks cool, however there is no benefit to this design what so ever. One can maneuver a standard bike much better, easier and faster than this thing. Definitely not simple at all either. Totally idiotic. Cranks behind the vertical from the hips? Is this for the reverse kneed among us? The diamond frame bicycle is one of the most timeless and efficient designs in mechanical history. This is simply impractical and stupid. The Bicymple isn't the first attempt to reinvent the bicycle we've seen; just a few weeks ago we discovered the Fliz bike, a pedal-less bike based on the concept of a velocipede. And while it's easy to dismiss the Fliz concept as impractical (and probably dangerous) experimental design, the Bicymple appears to be both unique and highly functional. "More than just a stylish concept bike, the bicymple is comfortable, easy to ride, and brilliantly simple to maintain," writes Scalyfish Designs. As anyone with a fixed-gear or single-speed bike will attest, the fewer components a bike has the easier it is to maintain; removing the chain takes away yet another thing that can break. As the designers point out, moving the wheels closer together would make it much easier to store the Bicymple for city dwellers. 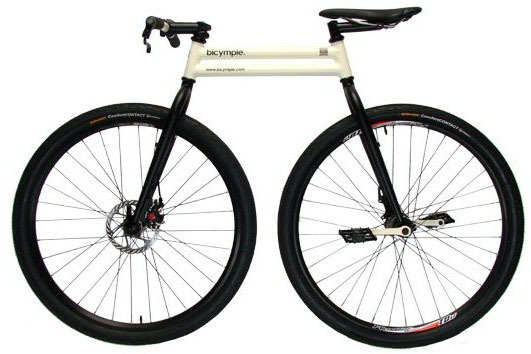 The Bicymple is still in development, and Scalyfish working on production and distribution models. And so far a price for the bike hasn't been released.